We envision a world in which epilepsy is widely understood, and where those who live with it feel fully supported. We build a caring community for people affected by epilepsy, through support, education and awareness. We are solely dedicated to supporting people living with epilepsy to live well. Over the past 60 years, Epilepsy Toronto has been the place where Torontonians living with epilepsy can learn more about their condition, get the help they need and be a part of a family of caring and supporting people. Epilepsy Toronto prioritizes individual needs, the importance of living as independently as possible and the benefits of community engagement. Our programs address all aspects of epilepsy from the first diagnosis of a child, to the struggles that young people face, to adult needs such as employment and relationships. Through Epilepsy Toronto’s programs, individuals can participate in trainings to build confidence and skills, share their medical concerns and challenges, discuss coping methods with people who understand, involve their schools or workplaces in awareness building, enjoy an outing with friends, learn about the latest epilepsy news and enjoy being in a place they can call “home”. With the diagnosis of epilepsy in a child, Epilepsy Toronto is often the first place a parent turns to for information, support and help. Our Children and Youth Services Director understands fully what parents are going through and can provide one-on-one counselling and years of acquired knowledge on how to overcome obstacles such as social, medical or educational. Our counselor will involve parents, schools and supporting agencies in navigating the education system, ensuring that appropriate accommodations are made. Interactive and fun presentations are available for students and teachers to learn how to respond to seizures appropriately. Seminars and workshops on topics relevant to parents of children living with epilepsy are routinely presented and offer the often harried parent a helping hand in coping. Click here to go to our CHILDREN AND YOUTH SERVICES page. Our SUPPORT GROUPS are so important to our members; it’s how we connect people living with epilepsy to each other. Through the support groups and our recreational activities, we bring people together to talk about their unique challenges and concerns. One on one counseling from our Adult Services Counselors are also available if a member needs help with any aspect of their life. Click here to go to our ADULT SERVICES page. Getting and keeping a job can be especially difficult for people with epilepsy. We can prepare job seekers for the job market and liaise with employers to ensure job retention. Through vocational and supportive counseling, we address employment standards, labour legislation, income supports, insurance and driving issues. Employing a person with epilepsy can cause some employers to hesitate due to misconceptions about safety issues. To address their concerns, Epilepsy Toronto has developed a training program for employers that provides detailed information on the often minor accommodations that are needed when hiring a person with epilepsy. Our Employment Manager and Job Developer have extensive experience working closely with employers to pave the way for a person with epilepsy to have an equal opportunity to enjoy a fulfilling career. Click here to go to our EMPLOYMENT SERVICES page. 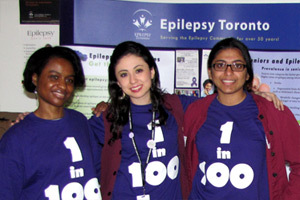 Epilepsy Toronto strives to eliminate the stigma surrounding this condition by providing a range of public outreach programs that include training Toronto Police officers in correct seizure response, presentations to school children and teachers that raise awareness about epilepsy, outreach to diverse communities to increase their access to Epilepsy Toronto’s services, and seminars for university and college students on epilepsy basics. Through our new Bridge the Gap Ambassador Program, we are able to reach more businesses and organizations across Toronto to inform them on epilepsy education. Reach out to us to request a presentation 416-964-9095. March 26th is Purple Day – the global Epilepsy Awareness Day- and over the years, Epilepsy Toronto has organized school activities, epilepsy information sessions, events at Nathan Phillips Square, SickKids,Toronto Western Hospital, Yonge-Dundas Square and many others. Other events organized by Epilepsy Toronto to help raise epilepsy awareness in our community include an Annual Epilepsy Conference, a Purple Walk, the Amari Thompson Soiree, Holiday Fair in Nathan Phillips Square, and the Toronto International BuskerFest in Support of Epilepsy Toronto, the largest epilepsy awareness event in the world. Epilepsy Toronto looks for opportunities to work with traditional and social media outlets to bring epilepsy out of the shadows and to invite everyone to ‘See The Person’, not the disease. We’ve been interviewed on television, radio and newspapers and continue to work hard at keeping epilepsy in the news. Be sure to sign up for our monthly e-newsletters for Parents, Adults and Employment seekers. Printed materials available include seizure response brochures/poster, epilepsy facts and information materials, booklets for parents and teachers and more. Click here to go to our PUBLIC EDUCATION page. 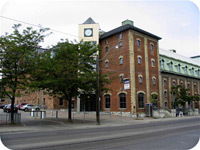 Located in downtown Toronto Epilepsy Toronto’s office is a bustling place where everyone is welcome. CONTACT US Call us, drop by or email us. We’d love to get to know you!